Sasith Manuranga and Amila Dayanaka joint winners the Golden Lions Challenge Trophy in the drawn game. Sasith scored 141 off 172 balls with 19 boundaries and a six to eclipse Chamindu Samarasinghe’s 104 scored the previous day while Tharindu was unfortunate to be stumped out on 97. Dharmapala electing to bat first were able to declare their first innings on 378/5 with Chamindu Samarasinghe scoring the first century of the seriees whille Navindu Naveen, Anila Dayanaka, Avishka Hasarinda and Dulaj Egodage contributed fifty plus scores. Rahula were 54/3 at stumps on day one and lost two more wickets within the first five overs of day two after which Sasith and Tharindu saved Rahula with the record sixth wicket stand. Rahula were all out for 330. Sanchana Lanka was the giant killer capturing the wickets of both Sasith and Tharindu. Sanchana and pacie Kavinda Ushan captured three wickets each while Chamidu was rewarded with two. Dharmapala were two wickets down for 44 runs at which time the high scoring game was called off and the awards presntation held. 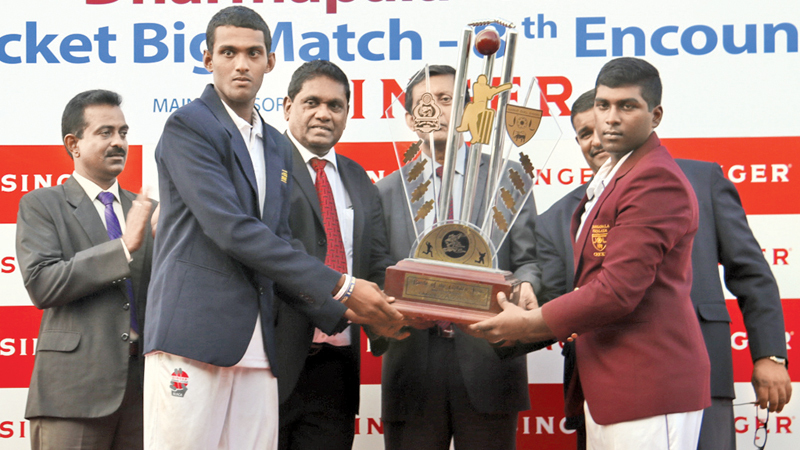 Dharmapala’s Chamindu Samarasinghe who scored the first century of the series was named Man of the Match the second consecutive time he won the award.